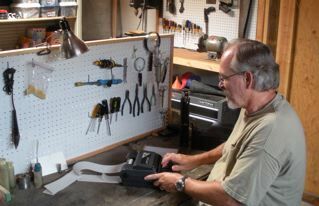 The Steno Guy An Interview With Larry Gordon Steno Repair Guru | Todd Olivas & Associates v3.0 | Court Reporting Services in Orange County, Riverside, San Bernardino, San Diego, Los Angeles, Irvine, Santa Ana, San Jose, Sacramento, Fresno, San Francisco, Bakersfield. TO&A employs no court reporters, interpreters or videographers of our own. The providers we send are fully qualified and reliable independent contractors. Court Reporter`s Calorie Calculator - How Many Will You Burn? Todd Olivas: What is your background in the court reporting repair business? Larry Gordon: Well, in general, I started in 1979. I was working for a small company over here in Orange named Hand's Office Equipment. There was a guy there that -- when I started, I was just doing typewriters and calculators, you know, assorted machines like that. There was a guy there that was repairing the loaners and rentals and things that they had and -- because they went through a lot of stenograph machines. And he quit on them. So the boss came back one day and said, Well, Larry, you do it. So that was my introduction into the stenograph business, and me and the book sat there for maybe six months trying to figure things out, because I had no training. Todd Olivas: What kind of machines were there back then? Larry Gordon: Oh, it was just the manual machines. That's all we were selling and renting at the time, so that's really all I saw. And then it was a few years before the Steno Electric even came out. Todd Olivas: So you've seen it all -- the whole morph from manual to electronic and computer-based? Larry Gordon: Oh, yeah. And everything is a little computer now. Everything. Todd Olivas: Does that make it more difficult than the old days? I imagine that your technology skills are up there. Larry Gordon: Well, yes and no. I mean, the more complicated things become, the easier your job becomes but the more dependent you become on the machine, too. In the old days everybody was transcribing their own notes, or they had a scopists doing it, or -- you know, something along that line. Nowadays the computer takes care of a lot of that work. Todd Olivas: These machines have their own onboard diagnostics? Larry Gordon: Well, not so much diagnostics. You still have to hook it up to the computer and make sure that everything is performing the way that it's supposed to be. But to say that I'm an expert on software or anything is a far cry from reality. I know enough to work on the machines, how they should sound, how they should feel -- and that's really the mechanical portion of it -- and then I hook it up to the computer and I let the computer tell me if everything else is working. Todd Olivas: Oh, I see. Larry Gordon: And it's really no more complicated than that. You hook up your machine and it tells you if everything is working fine. Todd Olivas: I actually liked your motto from your marketing e-mail. It says If you've written on it, I've probably worked on it. So you must have seen everything from A to Z.
Larry Gordon: Oh, yeah. There's some machines way back when that I really don't want to see ever again. Todd Olivas: Which ones are those? Larry Gordon: Well, back in the early days when they first started computerizing the machines, everything was being transcribed to a little cassette. And those machines are just a monster to try to work on. And some of those early machines -- even with the early machines with disc drives -- they must have had two miles of wiring in them. And to try to isolate down or try to figure out where a problem is in something like that is -- oh, my gosh -- it's just a nightmare. Just a nightmare. I'm glad those old machines have gone by the wayside. Larry Gordon: I mean, they not only weighed about fifteen pounds each, so lugging them around wasn't an easy task for anyone, but boy did they -- when they had a problem, they really had a problem. Todd Olivas: Let's say somebody did have a writer like that still today. And if they were to come to you with some archaic machinery, how do you actually get parts for those kind of machines now days? Larry Gordon: We really can't. There are some parts that are available still, but for the most part some of those real old machines -- the cassette drive machines, no. I won't even handle those at all. There's a couple of guys I can refer people to that have more experience. And they're more familiar. And they have more parts for those old machines. And luckily those machines are more museum-quality than user-quality now. Todd Olivas: So that might be a candidate for either the museum and/or that person is a good candidate to buy a new machine. Larry Gordon: Oh, sure. Some of them are -- a number of years ago, I was working at The StenoDoctor and a guy brought in an old, old mechanical machine, circa 1910. And he brought that in and he says, You know, I was clearing out my grandmother's garage and I found this and do you guys want it? And so I think we paid him like fifty bucks for it, something like that, and my comment at the time to Ed was, You know, this is in beautiful shape. This is honestly museum quality. I mean, it really is. Come to find out he had stolen it from a museum. Todd Olivas: Are you serious? Larry Gordon: He really had. Larry Gordon: No, we didn't -- we had no idea who he was, or anything like that. Didn't get his picture or his fingerprints or anything like that, but there was an ad in one of the -- heck, it must have been Cal-grams (phonetic) or something like that, a notice in there that said that this machine had been stolen, and we got to checking into it, and yep, it was the same machine. So, well, we had to turn it. We couldn't keep something like that. Todd Olivas: But you got a good story out of it, still. Larry Gordon: Oh, we got a good story out of it. I was cleaning out my grandmother's garage -- yeah, all right. It was just -- it was in perfect shape. It was just beautiful. I would -- honestly, I would have loved to keep it. Todd Olivas: Yeah, I'll bet. Larry Gordon: When you find something that's stolen like that, you've got to return it to the right parties, because they're missing it more than you ever want it, you know? Todd Olivas: Absolutely. So when did you decide to open up shop on your own? I know you were with The Steno Doctor. You worked on my machines there, but when did you decide to go out on your own? Larry Gordon: Well, basically the reason that I went out on my own was economic reasons. Like they say, there's been a slowdown in the industry and we weren't as busy at The Steno Doctor as everybody would have liked to have seen it, and they were slow. They just didn't have enough work for people to do, and I had been toying with the idea for some time, quite honestly. If nothing else, just -- I can stick around the house a little bit more, I can get things done and I can kind of slow down a little bit on toward retirement. And so that was really the essence of it all. We just put our minds together and said, This isn't working here, let's make it work here. Todd Olivas: I assume Ed over there knows about your new venture? Larry Gordon: Honestly, I haven't even talked to him a lot. I would assume that they know about it. It's -- this is a pretty close-knit community, court reporting is, and it would shock me to no end to find out they had no idea that I was opening my own place. Todd Olivas: Well, that's one of the great things about living in America, is that you can do that. Larry Gordon: Well, not only that, but I'm -- I don't want to take their business away from them. I certainly don't want to do that at all. I just want enough here to keep me busy, keep me happy. I mean, if I wanted their business, I'd try to buy that from them. Todd Olivas: Sounds reasonable. So, just really quickly, what is your opinion of the other competitors -- maybe not necessarily The Steno Doctor -- but others that are out there that I know of who advertise in the NCRA Journal and such. Larry Gordon: Well, over the years I've met quite a number of the competitors. And I think, without a doubt, they're some of the most professional people that I've ever met. There's not a one out there that doesn't try to do a good, quality job for the customer. There's probably a few that I would say well, maybe you don't want to -- but for the most part, overall, I would say if you were taking your machine to this person, and they are doing a good job for you, I wouldn't change. I mean, I've got a relative that -- it's kind of my stepmother's niece, one of those kind of things -- she is a court reporter and she actually takes her machine to a competitor of mine. And we've talked about it in the past, and I've said, well, gosh. And it's Ken Goodwin up there at LA Stenotype. Larry Gordon: And I tell her, well look, if Ken's doing a good job for you -- I wouldn't switch. Honestly. Ken's one of the good guys. Even wears a white hat. Larry Gordon: And so, I can't persuade her to -- I wouldn't even think to persuade her to leave him and come down to visit me, you know? Todd Olivas: That's very gracious of you. That's very humble, too. Larry Gordon: Well, if you've got somebody that's doing a good job for you, why should you change? Todd Olivas: Yeah, I agree. Larry Gordon: What's the point? Now, on the other hand, if for some -- and you can't do a great job for everybody out there. There's going to be a letdown somewhere, sometime. And if you find yourself in that position, where the guy you have servicing your machine is not doing what you want him to, or upholding what -- or it's just not feeling right for you, there's a number of people out there that can take care of that problem for you. Todd Olivas: Sure. There's a new one called The Steno Guy that I've heard about. I hear he's pretty good. Larry Gordon: What they hear is all good. Todd Olivas: They've got a lot of experience, just opened up shop. So what would you say are -- what are some tips that you have for reporters or students to properly maintain their writers on their own, even before having to hire a professional like yourself? Larry Gordon: Well, the normal servicing, there's nothing you can do about that. When your machine doesn't feel right, it's noisy, it's clunky -- you have no recourse but to take it to somebody like myself. However, having said that, there are general lubrication things that you can do on most of the older machines to keep it running right, keep it sounding better, and to maintain it a little bit better. Some of the newer writers, the paperless writers, they've pretty much taken all of that away from you. There's not a lot that you can do to that machine, other than adjust the key contacts and make sure that all of your electronic notes are coming out right. Those are things you can take care of yourself. But to try to get in there and lubricate anything... It's pretty much impossible anymore. Todd Olivas: Okay. And when somebody would send you their main writer, do you have loaners or rentals in the meantime? Larry Gordon: Well, somebody sending it in, no. I don't know of too many people out there besides Stenograph who actually send loaners out across the country anymore. I would imagine there's a few here and there, but for the most part, that business has pretty much been curtailed. Too much can happen at a long distance. You send your machine off to Salt Lake City, or something like that, and you don't get it back -- well, you're out $4000 for a loaned machine. Not only that, but then how do you get it back? Todd Olivas: Yeah, I hear you. Larry Gordon: So sending it out, no, I wouldn't be able to help there. I have a loaner or two here, but that's just for people bringing it in across the counter. Todd Olivas: Your rates -- you have a pretty competitive rate structure, from $160 to $200 for annual cleanings. Is that right around market standard, or is it lower than that? Larry Gordon: It's pretty even with some. It's lower than a lot of them. Larry Gordon: Let your fingers do the walking, you know? When in doubt, call them -- I mean, a phone call is not going to cost you much to find out what somebody else is going to charge you for what I can do here. I don't have a storefront like a lot of people, I don't have huge overhead like a lot of people. So if I can save myself some money, I'm certainly going to save court reporters some money, too. Todd Olivas: Well, that makes sense. And I honestly don't think that the average court reporter cares if you have a storefront, as long as you can get their machine in working order without any problems, and they can get back to what they do best. Then that's what important. Larry Gordon: Well, the most important thing is to keep your machine working right and get it back to use so that you can go out and earn that dollar. Todd Olivas: Earn that page rate. Exactly. So during the course of your career, what's the writer in the worst condition you've ever seen? You have any horror stories, or anything you care to share? Larry Gordon: Well, the one I probably like to tell the most -- not the one with the mouse in it, but -- I remember one where a woman brought it in and her cat had been using it for its toilet. And that was not a pleasant ordeal to go through. Todd Olivas: And did the writer still write? Larry Gordon: It was a little rusty as you can imagine, and there was a -- how shall we put it -- a faint aura of ammonia emanating from the inside. Yeah, it was pretty awful to work on. Todd Olivas: You've got to be a forensic expert. Larry Gordon: So I don't recommend you put -- all the time we find cat hair in these machines. For some reason, cats are just attracted to these. I don't know why. But I don't recommend letting them use it for their cat box. Todd Olivas: No, I wouldn't suggest that either. So were you able to fix that machine, or was that thing pretty much junk? Larry Gordon: Oh, no. Once you get it cleaned out and you get it well lubricated and everything, make whatever adjustments are necessary -- yeah, as far as I would know, that machine is probably still being used somewhere. Todd Olivas: Great. And do you sell new writers, or do you just specifically handle maintenance and repairs? Larry Gordon: Oh, it's maintenance only. I mean, for the most part, any of the manufacturers don't want us out there selling their product. Now, I don't know why that is -- you would think that they would want more people out there pushing and promoting their product, but they want to handle all the sales themselves. Stenograph, if you were to call them, they're going to tell you that they've got reps that will come to you and show you how to -- and that's probably what it comes to, is that they want to make sure that the machine is best represented by somebody who really knows it totally inside and out. Todd Olivas: Got it. So they just want to control that supply chain, I guess. Larry Gordon: That's probably the bottom line. Todd Olivas: Well, Larry, I really appreciate it. I think that's all that I had for this interview. Did you want to add any final words about what you're doing in your new venture? Larry Gordon: If you're dissatisfied with whoever you're doing service with, give me a try. If I can't satisfy you, well -- I don't know. Todd Olivas: They probably can't be satisfied. Larry Gordon: I mean, I'd appreciate any opportunity to see if I can do a better job than somebody you may be dissatisfied with. Todd Olivas: That sounds great. Thank you for your time. My name is Myra. I`m a court reporting student in Michigan. My husband`s company, Sprint/Nextel, has been laying off workers, and yep, he`s one of them. He`s been interested in maintaining steno machines for a while, so he gave Stenograph a call. There answer for training him on repairing machines was a big fat no. Is there a way that he can learn how to fix these machines on his own? He`s pretty much trying to keep his head up, trying to stay positive, and has a lot of faith. He`s got his mind set on if all fails, he`ll go back into the military. He`s an ex-Marine and ex-Army Reserve with Parkinson`s. I think it will be devastating for him if they said no to him on that too. He`s very determined man, a loving husband, and a father. Could you please guide us in the right direction? I humbly thank you in advance, Myra. Larry,I was reading on the internet about how you started your own business in steno repair. I was a court reporting student in San Diego for many years. I never obtained my license as an official reporter. I moved to Jacksonville, FL four years ago and met my husband. I still have a burning desire for the field of court reporting. My husband is very mechanically inclined. I talked with him regarding steno repair and how important a good repairman was to a court report and student. He has recently been laid off from his job and is really interested in the possibility of repairing these machines. My husband is 53 years old and I believe this is something he can do for a long time. Do you know where he can go or who to call in order to get certified to work on steno machines? I realize that you had on-the-job training. I was hoping you might know how he could get started in this business. 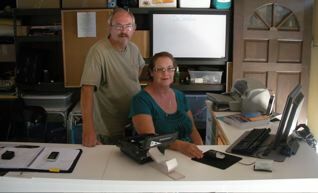 There is only one certified Stenograph repairman in Jacksonville, FL. Any information or advice you could give us on this would be great. Do you have any ideas on how to fix a key on a steno machine that keeps sticking?